You have just accidentally deleted all the photos from your smartphone, and don't know what to do to get them back? Download Tenorshare Android Data Recovery software to your PC, and connect your smartphone to it. The program scans your mobile device from top to bottom, looking for any recently deleted files. Once the list is established, it gives you the possibility to restore the files of your choice. 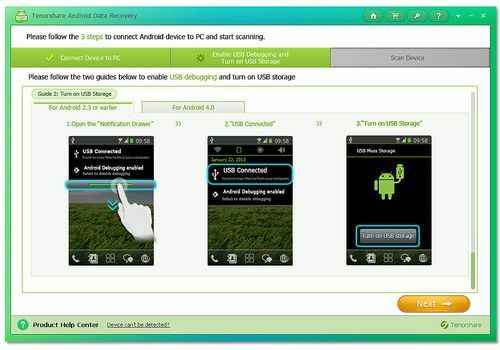 Tenorshare Android Data Recovery is able to recover your contacts, SMS, photos, videos, or even your audio files. Well thought out, this software works with most smartphones and Android tablets made by Samsung, LG, HTC, Motorola, Google, and more. As a result, downloading Tenorshare Android Data Recovery is the assurance of recovering all your deleted files inadvertently, and thus missing out on the nervous breakdown usually caused by this kind of situation. Exchange Server Depth Recovery is a software that recovers emails and data when a mail server crashes or if the system corrupts.